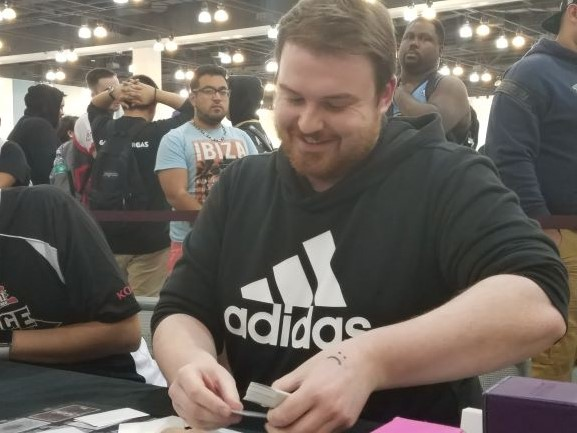 We’re in the final Swiss round of YCS Pasadena! Abraham King, from Oregon, is using a Thunder Dragon strategy. 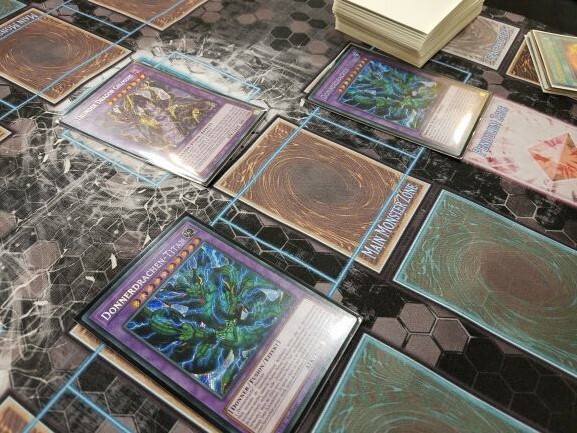 The Deck came out hot on the scene at YCS Niagra Falls, but failed to reach the success many expected them to. However, there’s a good number of Thunder Dragon Duelists showing that the strategy is able to compete. King’s opponent is Darren Stephenson, here from the United Kingdom! 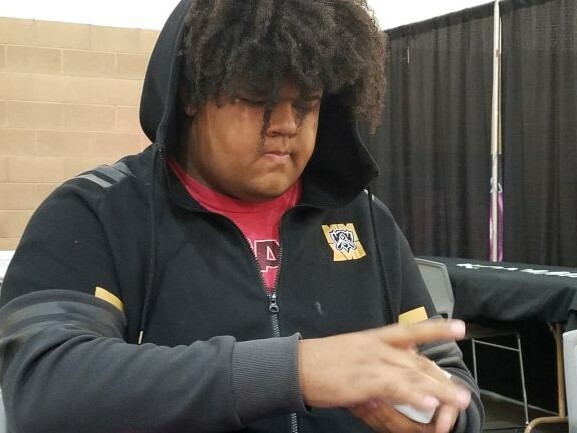 He’s packing a Gouki Deck, one of the most popular strategies this weekend. His Deck gets a major power boost while playing here instead of at home, since Summon Sorceress is not yet legal for play in Europe. King won the dice roll and chose to play first. He started with a hand of Instant Fusion, Thunder Dragonduo, Thunder Dragonhawk, Thunder Dragondark, and Rivalry of Warlords. He used Thunder Dragondark, adding another Dragondark to his hand. He then used Thunder Dragonhawk to Special Summon Dragondark from his Graveyard. He Tributed it to Special Summon Thunder Dragon Colossus in Defense Position, and Set Rivalry. Stephenson Special Summoned Junk Forward, then Normal Summoned Dark Grepher. Grepher discarded Danger!? Tsuchinoko? to send Destiny HERO – Malicious to the Graveyard. Tsuchinoko activated, and King flipped Rivalry to keep it from hitting the field. Stephenson used his Warriors to play Isolde, Two Tales of the Noble Knights. 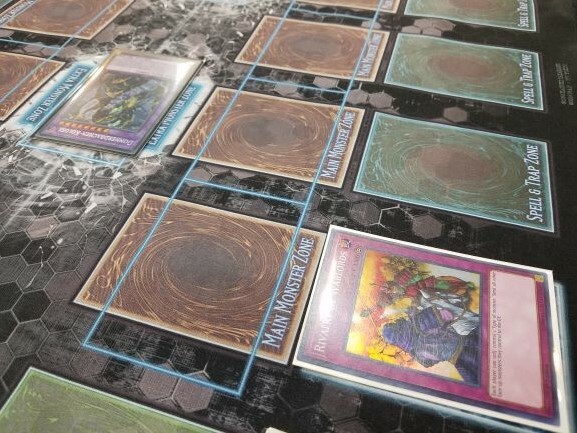 He started using its second effect, but realized he wouldn’t be able to play through King’s field either way, and conceded the first Duel. Stephenson activated Danger! Nessie!, discarding Twistcobra. He Special Summoned Nessie in Attack Position and drew a card. He Set two back row cards. King had a hand of Batteryman Solar, Ash Blossom & Joyous Spring, Thunder Dragonduo, Thunder Dragondark, and Thunder Dragon Fusion. He drew Thunder Dragonmatrix. King started out with Batteryman Solar, sending Thunder Dragonroar to the Graveyard. He activated Dragonhawk, Stephenson flipped Called by the Grave to banish Dragonroar. Dragonhawk Special Summoned the banished Dragonroar anyway, but Dragonroar’s effects would still be locked down for the turn. Solar Special Summoned a Batteryman Token. He used the Token and Dragonroar to play Some Summer Summoner, then Tributed Solar to play Thunder Dragon Colossus. He banished Colossus and Dragondark to play Thunder Dragon Titan, and Dragondark added Thunder Dragon to his hand. He activated Thunder Dragon, and Stephenson flipped another Called by the Grave to negate and banish it. King activated Thunder Dragon Fusion, combining his banished Thunder monsters to play a second Titan! He used Dragonmatrix to boost the ATK of one of his Titans, and Titan wiped out Nessie! Finally, he Tributed Some Summer Summoner to play Colossus! His electrifying monsters attacked and wiped out Stephenson’s Life Points! Abraham King wins the final round with Thunder Dragons!